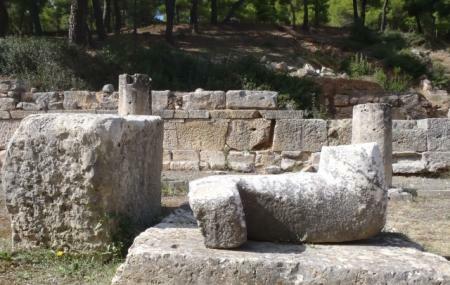 Find hotel near Amphiareion Archaeologica ..
A mythological and historical site, the Amphiareion Archaeological site is still an unexplored tourist destination. Founded sometime in the 5th Century B.C. and spread across a relatively small area, it is assumed that the Amphiareion was used as a sort of a healing facility where sick or worried people used to visit to get rid of their troubles. Many forms of treatments were used. One can still make out from the excavations, the baths, the stoa, the theatre, the temple of Amphiaraus and the treatment rooms. The Amphiareion Archaeological site is situated around an hour’s drive from Athens. Packed picnic basket is recommended. Free for Seniors over 65 and for students. Travel by taxi or rent a car. How popular is Amphiareion Archaeological Site? People normally club together Kerameikos Cemetery and Marathon Run Museum while planning their visit to Amphiareion Archaeological Site. People also prefer to start their day with Amphiareion Archaeological Site. As for the stuff working there , everybody, especially the entrance guard - cashier , excellent person, very kind and helpful. As for the area, Excellent energy field , really clean , peaceful area, quiet enough with the sounds of nature to travel you mind... Very good that all the sites are open (without rope borders e.t.c.) so you can touch and feel every one of the findings. Will go again to feel the excellent energy field of this place. Very unique location! Antiquity meets Greek nature. Far away from city noise, this place has good vibes. Not very popular tourist attraction, so is really peaceful. Visited on Saturday and stayed for 2 hours being the only visitor! Great place for meditation or relaxing in nature.. Very exciting. Got a guided tour free of one of the men working at the museum. He knew so much of the place and he did it in a very vivid way.